The all new large 5 seat SUV is the last in the Renault range to be revamped and is an impressive family SUV. It comes with state of the art technology and options, along with a vast array of safety features including Tiredness detection, Lane departure warning, Active emergency braking, Traffic sign recognition and front and rear parking sensors to name a few. The Koleos comes with a massive boot space for everything you could need 624-litres to be exact and that’s with the seats up, in fact everything about the Koleos is large. It has been styled to be a well-rounded SUV and is capable off road, with its high ground clearance, large wheels and superb switchable four wheel drive system which will switch the torque between the wheels in Auto mode at lower speeds. There is also permanent four wheel drive option which can be switched on as and when required. 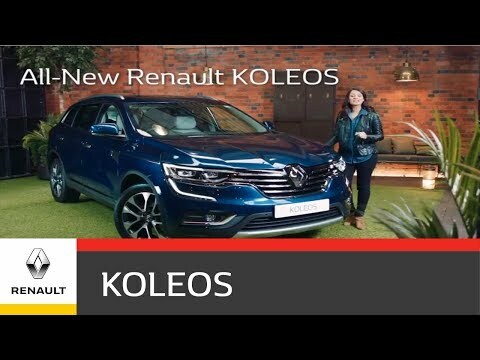 The New Renault Koleos is available in 2 trim levels : Dynamique S Nav & Signature Nav. The engines on offer will be 2 petrol and 2 diesels ranging from 128 BHP – 173 BHP and will come in manual and automatic.